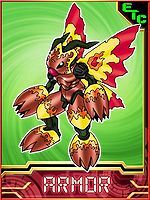 An Armor-level Insect Digimon that evolved through the power of the "Digimental of Courage". To be precise, it took the form of an insect-humanoid, but its form had an unfortunate adverse reaction to the "Digimental of Courage" and became fiendish. As with Fladramon it manipulates flames, and its hand-to-hand combat ability is almost on par, but it is a wicked being, exactly opposite like light and darkness. Its Special Move is a red hot blaze emitted from both hands (Flare Buster). 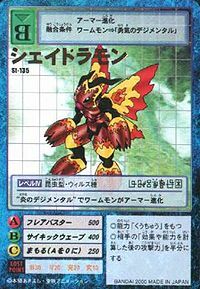 Flare Buster  フレアバスター Furea Basutā Flash Buster/Flare Buster Scorching-hot flames fired from both its arms or sets itself on fire and rams the opponent. Indent Screw  インデントスクリュー Indento Sukuryū Serrated Screw Strikes the opponent with stretched-out arms while rotating. Emits a psychic wave from all its body. Shadramon is the Partner Digimon of Ichijouji Ken. Shadramon is only obtainable as a collectible card. 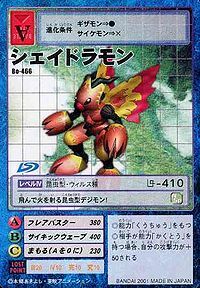 Its card is part of the Digimental of Courage (勇気のデジメンタル Yūki no Dejimentaru) set. Shadramon is available as a Digimon Medal. 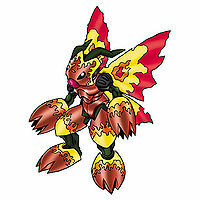 Evolves from Wormmon with the Digimental of Courage, and is one of the playable Partner Digimon. 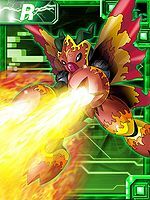 Wormmon's Armor Evolution with the Digimental of Fire. This Insect-type Digimon flies up and shoots fire from the air!